I’m still thinking about memory today, but not all the things I keep forgetting. (If I’ve forgotten them, I can’t think about them anyway.) No, it’s the memories of things I did when I was little. Chapter 3 of Twyla Tharp’s Creative Habit is about Creative DNA. (Yes, I’m only on Chapter 3 – it’s hard to create something every day AND read. Don’t ask me about the Power Of Habit book.) 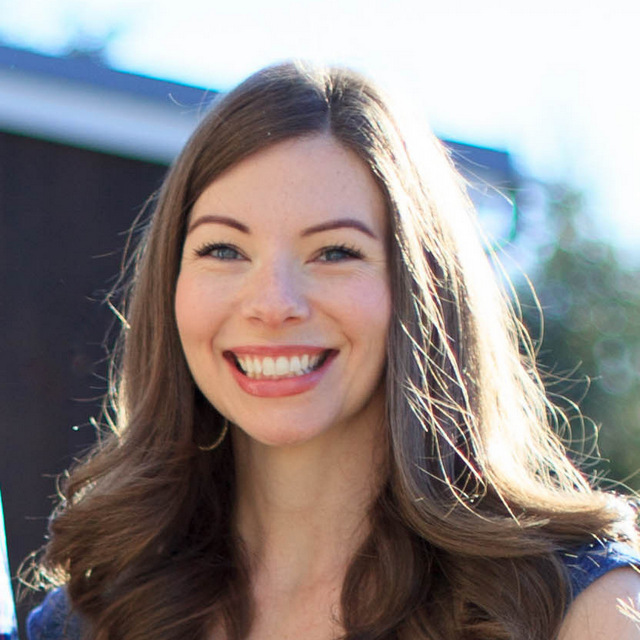 She talks about who we are and what we create being our DNA of sorts – our “creative hard-wiring or personality”. I’ve written before about making jewelry as a child, about going to garage sales and flea markets and coming home to put pieces together. And about going to Goodwill to piece together costumes for drama productions. 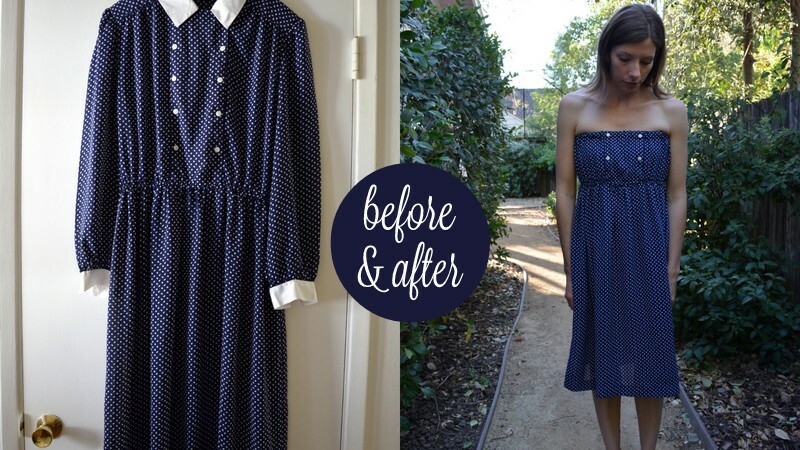 Somehow, through the course of my life, that has evolved into a passion for repurposing – for recreating something, breathing new life into an old piece. 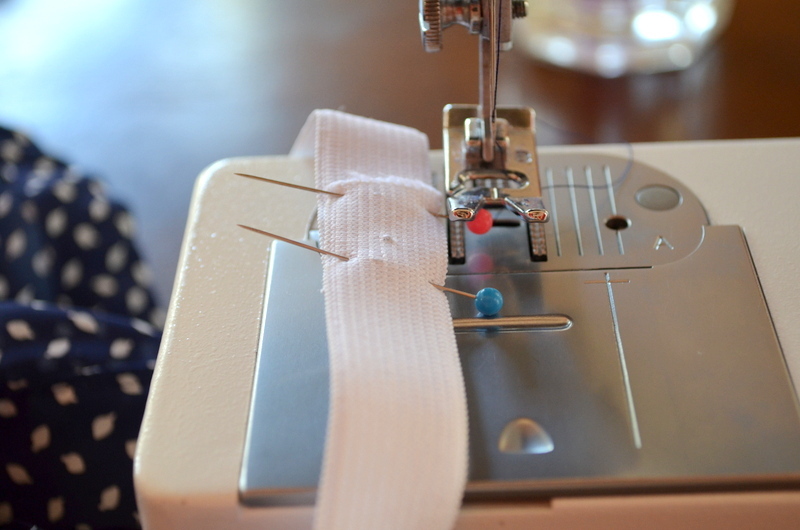 Take today’s project – a dress. I could go buy fabric and make a similar dress. But for some reason, the challenge, the “making it work”, the creating something new from something old, is the joy for me – taking the broken and discarded and piecing it together into something lovely and purposeful again. So, here’s how this dress started out. 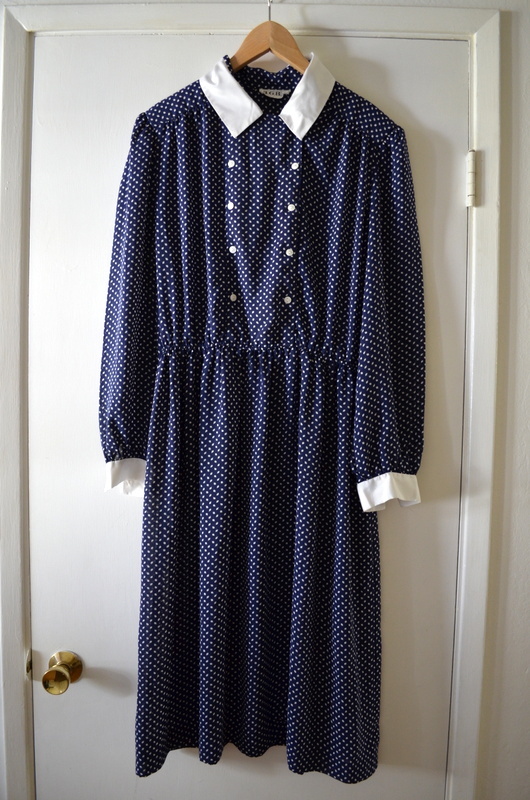 Shoulder pads, double buttoned placket, white collar and cuffs – pretty frumpy. But I loved the fabric. 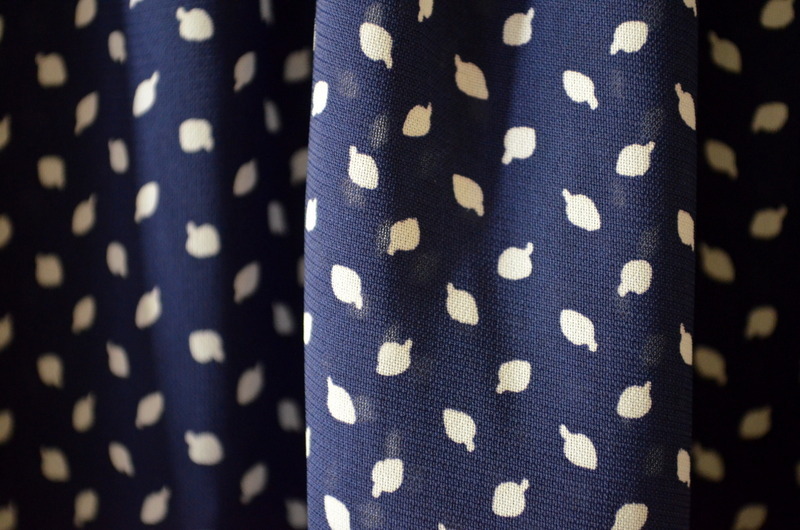 It looks like polka dots, but it’s really more of a leaf design close-up. 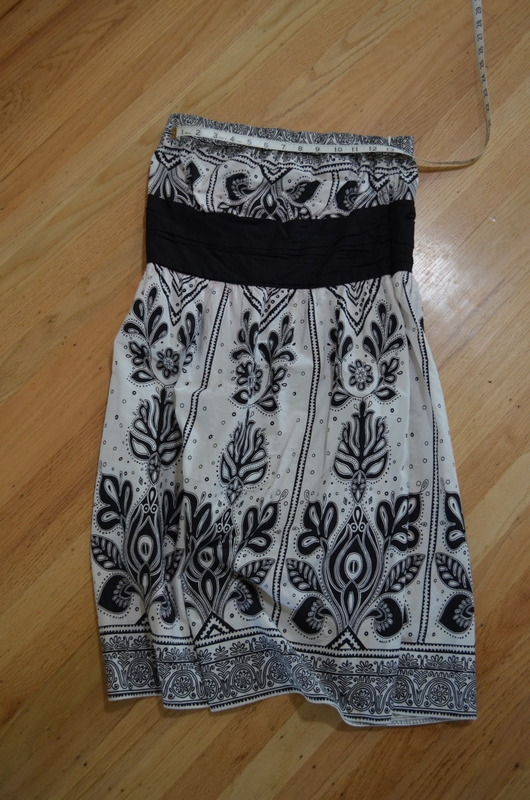 I decided to un-frump it by making it a strapless dress. I found an old dress in the closet and measured the top of it to determine the size. 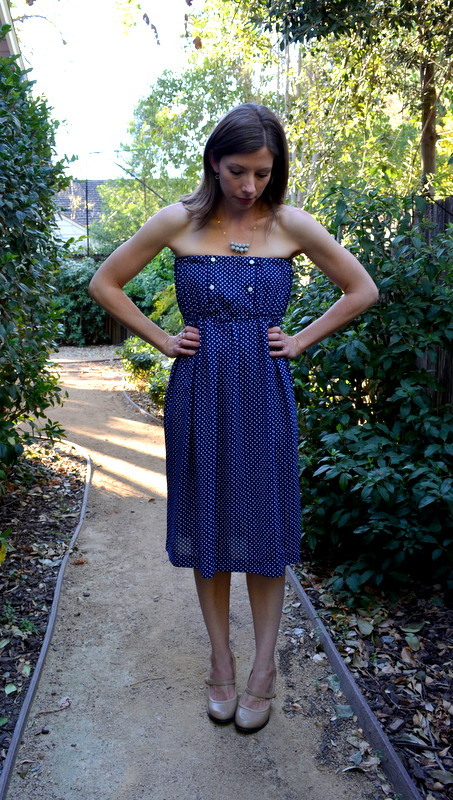 I made this dress similarly to how I make a skirt with elastic. 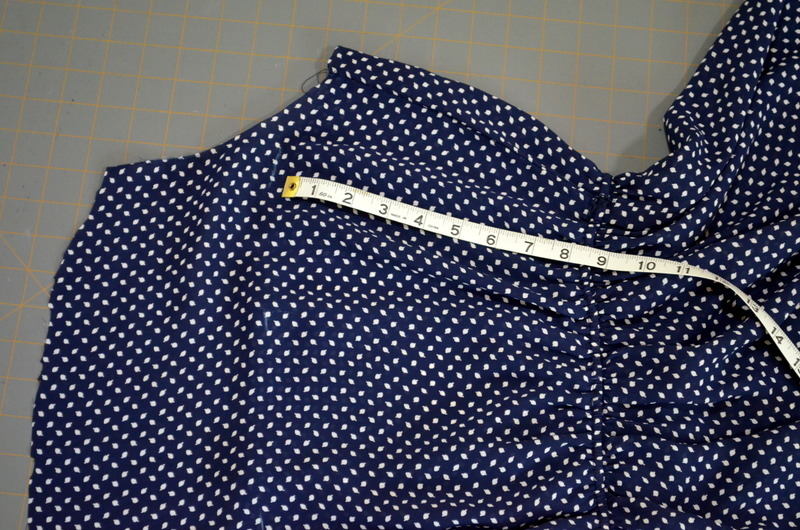 I measured the length from the waistband to the sleeve opening to make that the measurement for the entire bodice. 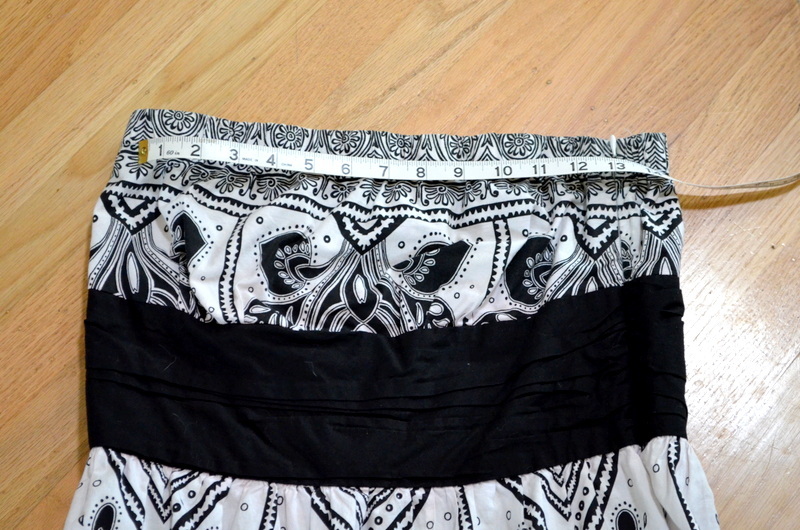 I cut the fabric, sewed a little channel for the elastic, and stitched it up, leaving a bit open to insert the elastic. I threaded the elastic through the channel and then stitched the elastic together before closing up the channel of fabric. It needed a little something, so I paired it with my new necklace. I kept the original buttons, but I’m not sure I like them. What do you think? If I remove them, will it look weird with the button holes? Please, share your thoughts! Next Post 31 Days: Creative Habit – Day 25: Oops! Aww, thanks, Anne! I haven’t seen that show in years. Need to find that episode to watch today! Wow! what a transformation. It looks awesome and you look awesome in it. I like the buttons. I just can’t believe you would even purchase that dress. I do not share in this re-purpose of clothes…decor, any day. You’ve got the talent and the eye. Thanks! It’s really fun – and a little addictive. Ooh, that’s a great idea! Thanks, Marilyn! :) Thank you, Chelsae. So, are you dressing up for Halloween Bunco tonight? My first thought was like Marilyn’s. Lose the white buttons and replace with blue buttons. They would be cute but not stand out so much. Great job, sweetie! Thanks, Mom. Now I need to find some blue buttons….